The stories of the Nordic gods is something that many people find exciting. 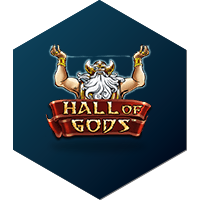 Hall of Gods has combined all your favourite Nordic gods together with massive progressive jackpots containing millions. Contains two different features where you can try your luck today. In this Action-filled slot from Net Entertainment, we witness treasures and different nordic gods such as Thor and his hammer, Oden the wise God and Idun the God of love and knowledge. These are just a few of the symbols you’ll find in this fantastic slot. You’ll also find Expanding Wild Symbols, Bonus symbols and Scatters that triggers different exciting Features. Apart from the great trip back in time Hall of Gods also offers a Progressive Mega Jackpot that can be triggered in the exciting Bonus feature. It’s usually up at several million at a time that’s eventually triggered to one lucky winner. The slot contains three different bonuses, Mini, Midi and Mega whereas Mega is the biggest one that can make you much, much richer fast. Hall of Gods contains the usual five wheels with three rows and 20 different pay lines. On wheel 2, 3 and 4 you’ll find Wild symbols that replace all other symbols and helps you build pay lines that can give you some sweet wins if you hit a nice line with premium symbols. However, the real potential lies in the features that this game offers such as the Free Spins and the Bonus, we’ve gone through them below! Bonus Feature: If you manage to hit three bonus symbols you’ll move on to the Bonus game. When inside the bonus game you’ll use Thor’s hammer to break the shields. In total there are 15 different shields, and you want to find three of the same symbols. Behind these shield hides different cash prizes as well as one of the three jackpots, Mini, Midi and Mega. When you’ve managed to match three of the same symbol, you’ll win the prize, which hopefully is a jackpot! Free Spins Feature: To get the Free Spins you want to hit three scatters in the main game, you’ll then move on to this exciting Free Spins feature which will grant you between 10 and 20 Free Spins depending on how many Scatters you landed. 3 Gives 10, 4 gives 15 and 5 gives a total of 20 Free Spins. In the Free Spins, all your winnings will be tripled which can grant some really sweet wins if you’re lucky! This is a pretty unique and exciting slot from Net Entertainment where your picks decide your fate for you instead of just spinning a completely random wheel. Sometimes it can be nice to feel that you’ve earned yourself the jackpot instead of just having luck decide your fate. Just ask the Swedish player from Nyköping who won the Mega Jackpot and took home 6.7 Million Euro on a 2 Euro bet. Who knows, maybe you’ll be our next Jackpot winner.